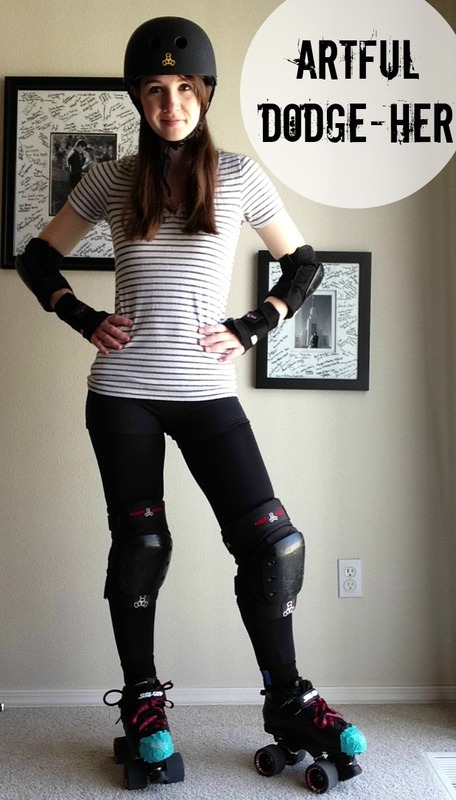 what you’ve all been waiting for… a roller derby update. I’ve been skating with Nampa’s roller derby team, the Beet City Bombers, since January. It’s been incredible and for some reason comes as a shock whenever I tell people about it. 😉 (ps. they’re always looking for fresh meat and are willing to teach you how to skate if needed!) I’ll keep all of you updated about this whole adventure as it comes, but for now, let me tell you about my skates. Rebel sure-grip boot with Avenger metal plate, DA45 trucks, Fugitive wheels…if that means anything to you. From what I’ve heard from people and read in reviews, they’re a respectable beginner skate that I can use for quite some time. The FIRST time I wore them, I promptly scuffed up the toe of my boot practicing a one-knee fall. Until I get some legitimate toe covers, I’m planning to get by with duck tape. 10 points and my utmost respect to anyone who knows the reference to that name BEFORE reading the next paragraph! The Artful Dodger is the leader of the pickpocket gang in the classic novel Oliver Twist. (It’s ok. I didn’t know that until a couple months ago). The name came up at work one day when I narrowly escaped being hit by some form of body fluid… and after multiple brainstorm sessions to think up a derby name, I kept coming back to this one. So. There it is. Anna ‘artful dodge-her’ Rodriguez. Thanks to all of you who linked up on Wednesday! I loved reading about your nursing school experiences. Have a wonderful Easter weekend! I hope you’re getting the same beautiful weather I’m getting here in Idaho. Perfect for egg hunts, bike rides, and picnics. Or maybe roller skating on the greenbelt. a couple of things update. For you, I’d sit in a waiting room for an hour and a half. I totally knew that oliver twist reference! I’ve always been intrigued by roller derby! That is so cool. Did you see Whip it with drew barrymore and ellen page? I bet it’s nothing like that but I liked the movie. Hahahaha!! I understood that reference!! Reading through Oliver Twist right now.. Coolness! so fun! you are a brave lady. i am terrified of falling…let alone getting knocked over! Good name! I can’t resist a good literary reference! I was in the play Oliver in high school so I go that one for sure. I totally love it. Seems to suite you too. Great name Love it! And your hobby is so awesome! You are so cool, Anna!